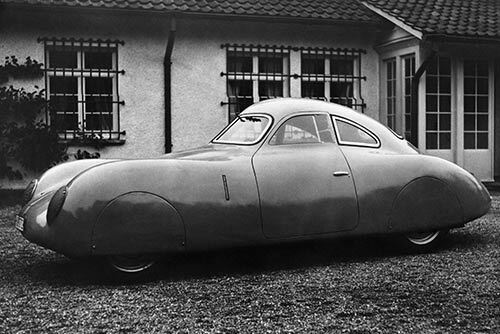 The Type 64 was a racing car Porsche developed in 1939. Based on the original Type 60 “Kraft durch Freude Car” Volkswagen (Beetle) that Porsche were developing for, it was intended to promote the new peoples car in the long-distance 1939 Berlin to Rome race. Under the internal code name Type 64 or, respectively, Type 60K10, (the Beetle was codenamed Type 60) the engineering team developed and built three racing coupés in spring 1939 for the “Non-Stop Speed Trial”, as it was called, planned for September that year. As a long stretch of this 1,500-kilometre race was to be on the new German autobahn, Porsche and his engineers gave particular consideration to streamlining. With its aerodynamic aluminium body, fully covered wheel arches and a modified flat-four VW engine initially developing 33 bhp, the Berlin-Rome Car reached a top speed of 90 mph (145 km/h). The outbreak of World War II, just weeks before the race was due to take place, caused the race to be cancelled. Porsche and his engineers used the Type 64 already completed for the road as a fast grand touring sports car averaging a speed of 130 km/h or 80 mph on their journeys from Stuttgart to Berlin. Two of the three Type 64’s survived the war. One, discovered by American GI’s in 1945 and was destroyed while joy-riding. This car was meticulously restored by Automuseum Prototyp in Hamburg (there is a great story in Octane magazine about the restoration and what it’s like to drive a Type 64. Read it here). The other Type 64 was restored and sold to by Porsche in 1949 to (one-armed) Austrian motorcycle racer Otto Mathe, who won an Alpine Rally cup in the car in 1950 and was still driving it into the early 1980s. The rest, as they say, is history. After the war ended, Porsche went on to build 52 alloy-bodied 356’s (known as Gmund coupes – see a video of a Gmund coupe here) from 1948 to 1950 before production moved to Stuttgart. You can see the family resemblance between the Type 64 and 356 and the beautifully styled Type 64 is acknowledged as the seed from which all Porsche sports cars have grown since 1948.